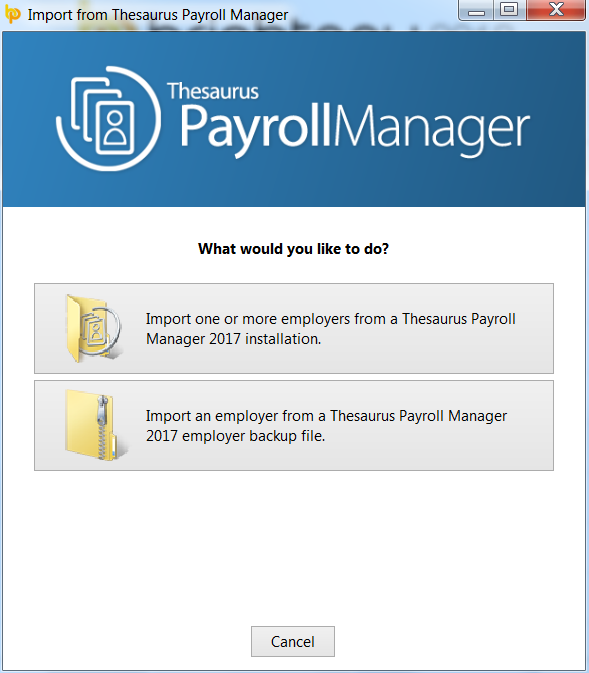 If you choose to change from using Thesaurus Payroll Manager to BrightPay, you can import your Thesaurus Payroll Manager directly into BrightPay at any stage of the year, i.e. at the commencement of the new tax year or mid way through the tax year. The smoothest transition will be to import at the start of the tax year so that the historical payroll detail, payslips and periodical reports all reside in the one program. 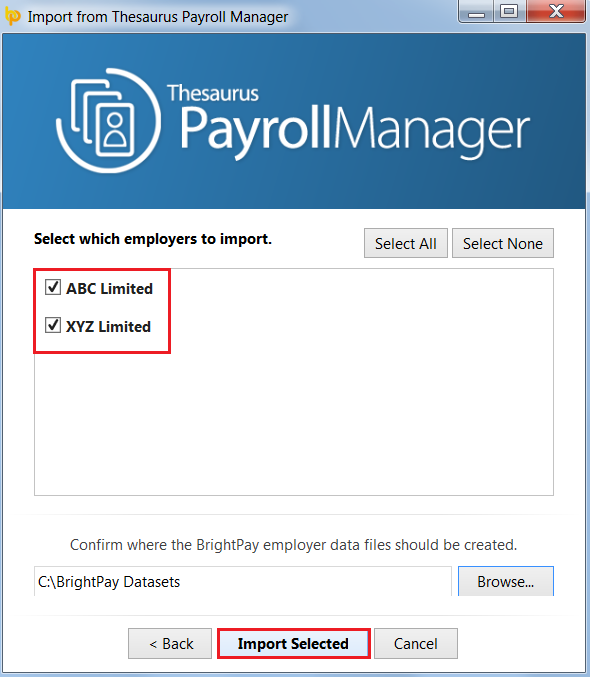 To facilitate the changeover to BrightPay 2018, all employee records can be imported directly from Thesaurus Payroll Manager 2017. 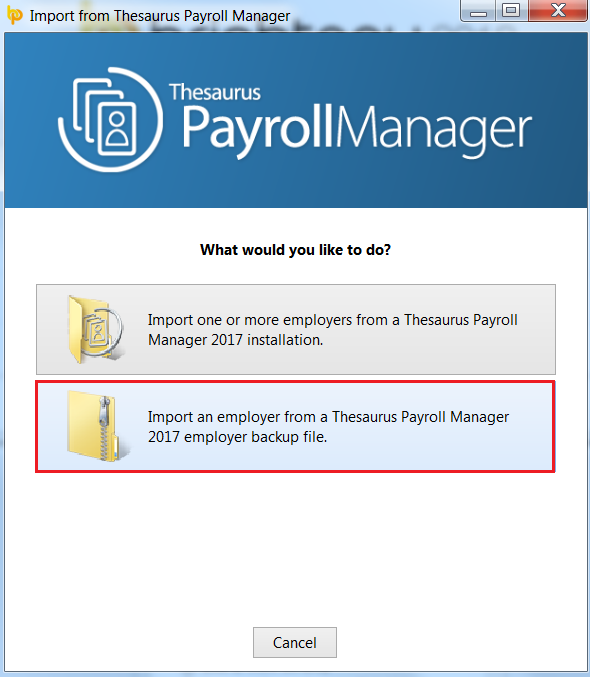 To import your previous year’s company and employee details from Thesaurus Payroll Manager, simply click ‘Import Employer’ on the ‘Open Employer’ screen, followed by ‘Import from Thesaurus Payroll 2017…’ > "Start at the beginning of 2018"
Here you will be given two options – to import from your Thesaurus Payroll Manager installation folder or to import using a Thesaurus Payroll Manager employer backup file. 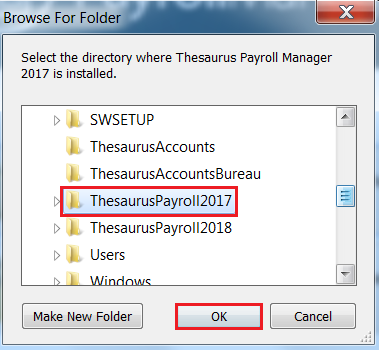 Before selecting this option, please ensure that Thesaurus Payroll 2017 is not running in the background. On the next screen simply select the employer files which you would like to import and select a location where you would like these employer data files to be created. When ready, click ‘Import Selected’. A confirmation message will appear to confirm the import has been successful. Click "OK" to continue. Your employer file(s) will now be available to open on the 'Open Company' screen. Please note: the password to open your new BrightPay employer file will be reset to ‘password’. When the employer file opens, you will be prompted to change this password if you wish. 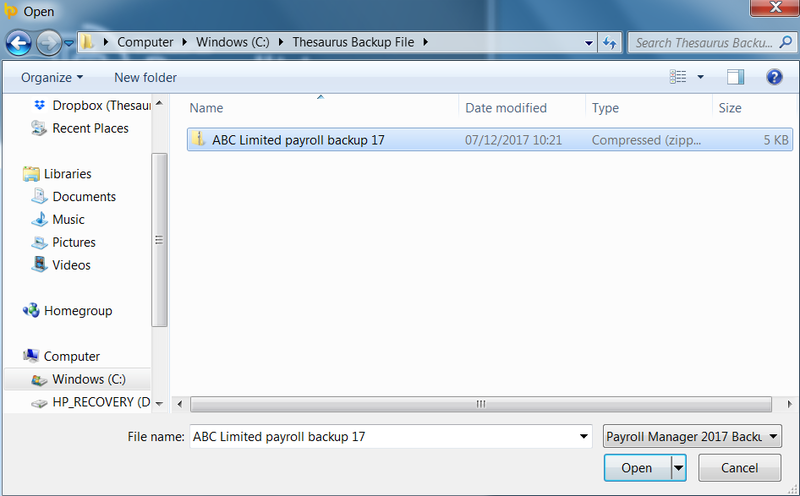 Next, browse to the location of your 2017 payroll backup file and click ‘Open’ to start the import. In both import cases, it is always recommended that all company and employee details are verified before processing any payroll to ensure information imported across is still applicable and correct for the new tax year. Benefit in Kind, additions and deductions (including pension deductions) will NOT import, therefore these must be set up in the first pay period for each applicable employee.